Consistent performer Call Me Handsome has graduated to better company with an all-the-way win in the Heatherlie Stakes at Caulfield. 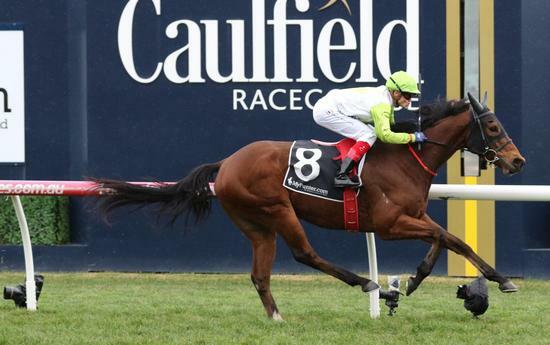 The victory on Saturday has opened up options for the former Hong Kong-trained galloper. Sent off the $2.70 favourite under Craig Williams, Call Me Handsome scored a long neck win over Mr Garcia ($8.50) with Sin To Win ($9) a nose away third. Call Me Handsome was trained in Hong Kong by David Hall and at his second start finished third to champion galloper Pakistan Star. Shortly after the gelding suffered a suspensory injury, resulting in the gelding being transferred to trainer Peter Gelagotis. Gelagotis’ brother Manny joined Hall in the ownership of the gelding with Saturday’s victory his fifth in Australia. “He’s got a big heart and is very honest,” Manny Gelagotis said. “I was very confident today at the weights as he’s been hard to place. Gelagotis hopes the gelding can continue on an upward spiral at the start of the Melbourne spring. He said he had been watching Darren Weir and how he places his horses. “I like the way he places his horses as when they’re performing well they go up in class but drop in weight,” Gelagotis said. “He’s a set-weights and penalties horse so there’s some nice options coming up, whether he’s good enough, I’m not sure.